ISLAMABAD, Pakistan (CNN) -- The United Nations' refugee agency warned Friday of a "massive displacement" of civilians as Pakistan's military broadens its offensive against Taliban militants in the country's troubled northwest. Tens of thousands of Pakistani civilians have been forced to abandon their homes in the past few days. In the last few days, an estimated 150,000 to 200,000 Pakistanis have fled to North West Frontier Province, just south of the military operation, according to U.N. High Commissioner for Refugees spokesman Ron Redmond, citing provincial government data. 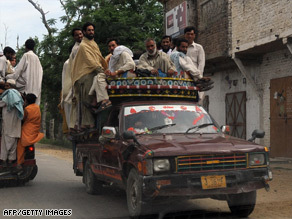 Another 300,000 Pakistanis are on the move or expected to flee the fighting, he said Friday. The massive displacement is a result of "more widespread" fighting between Pakistani forces and Taliban militants as well as people taking "advantage of the partial lifting of curfews to move into safer areas," according to a UNHCR news release. Over the past 24 hours, Pakistan's military said its operation had killed 140 militants -- a dramatic increase from the previous daily tolls given by the military during operation that began nearly two weeks ago. The military offensive is overwhelming medical resources in the Swat Valley, hospital officials said Friday. Mardan Medical Center has treated more than 2,000 patients injured in the clashes over the past two weeks -- most of them with shrapnel wounds -- according to Dr. Arshad Ahmed. The fighting has also trapped 40 children at an orphanage in Mingora, the district capital of Swat, according to Muhammad Ali, the orphanage director. The children range between the ages of 5 and 17. They have been hiding in the basement while Pakistani troops stood guard on the roof of the four-story building, Ali said. They have been trapped inside since Wednesday; 22 of the kids were able to leave a day later, Ali said. One of the kids who was able to leave -- Muhammad Yousef, 16 -- told CNN that the conditions inside the orphanage were "bad and intense." "From where we were, I could see the army and the Taliban fighting each other," Yousef said. "It was tough to try to get out of Swat ... sitting on buses and trucks. There are still kids inside the building and I pray that they will come out alive." Fighter jets and helicopter gunships pounded Taliban fighters in Swat Valley Friday, and a Pakistani military official told CNN that more troops will join the 12,000 to 15,000 already in the region. Pakistani aircraft attacked a militant position in Tehsil Kabbel, where the Taliban were occupying two girls' schools. Helicopter gunships fired on the buildings, killing up to 15 militants and critically injuring four others, said Maj. Naser Khan, a Pakistani military spokesman. Government forces battled militants in Kanju after the Taliban attacked an outpost just across the Swat River. After a heavy exchange of fire between militants and government forces, Khan said, five "hard-core" militants -- including a commander by the name of Akbar Ali -- were killed. The action comes hours after Pakistani Prime Minister Yousuf Raza Gilani formally renounced a peace agreement with Taliban militants and announced "decisive steps" to expand the battle in the country's northwest. The agreement effectively ended several weeks ago, when Taliban militants violated the deal by refusing to disarm and by advancing into the Buner district, which is about 60 miles of Islamabad, the nation's capital. Pakistani troops have battled the Taliban in the Buner and Lower Dir districts for nearly two weeks. The now-defunct peace deal allowed the Taliban to implement Islamic law, or sharia, in the Swat Valley region in exchange for an end to fighting. "I regret to say that our bona fide intention to prefer reconciliation with them was perceived as a weakness on our part," Gilani said. CNN's Samson Desta and Reza Sayah contributed to this report.